A member of Texas State Aquarium Wildlife Rescue Center in partnership with Sector/Air Station Corpus Christi releases two rehabilitated sea turtle hatchlings on March 29, 2019 near Port Aransas, Texas. 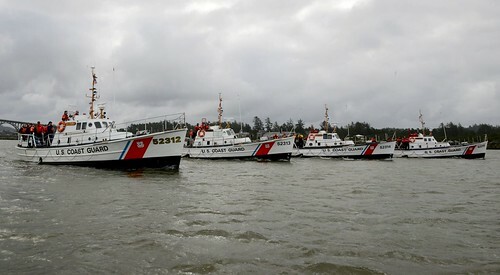 U.S. Coast Guard photo by Station Port Aransas. CORPUS CHRISTI, Texas — The Coast Guard, in partnership with the Texas State Aquarium Wildlife Rescue Center, released two rehabilitated sea turtles near Port Aransas, Texas, Friday. The release of the two rehabilitated hatchlings, a loggerhead sea turtle and a Kemp’s ridley sea turtle, is a result of a Memorandum of Understanding between Coast Guard Sector/Air Station Corpus Christi and the Texas State Aquarium Wildlife Rescue Center expanding cooperative efforts to rescue and release rehabilitated sea turtles. Upon rehabilitation, the Texas State Aquarium reviews local weather and tidal patterns and other factors to identify a release location. Areas where the water is warm enough to sustain the sea turtles’ survival are often located miles offshore, necessitating the assistance of local Coast Guard crews and assets for transportation. As always, the Texas State Aquarium’s Wildlife Rescue Center is asking beach-goers and other residents to be on the lookout for stranded sea turtles. To report a stranded sea turtle on North Padre Island or in the upper Laguna Madre area, call: 361-949-8173 ext. 226. For other areas, call 1-866-TURTLE-5. Stranded sea turtles in the North Beach and downtown Corpus Christi area can be reported to the Aquarium’s Wildlife Rescue Center at 361-881-1210.